Anything less that gourmet coffee beans is not good enough. At Tartaruga’s Hotel in Pagudpud we have a coffee shop to serve all those Pagudpud visitors with high qualityPhilippine coffee. We offer a range of Philippine coffees that would not normally been seen in many chain store coffee shops. Have a coffee holiday! We also brew using a quality Rancilio espresso machine and everyone has been Barista trained. Coffee is important to Filipinos and it has been inherent in the culture for a very long time. This isn’t part of the new global coffee fad but goes back more then 2 centuries when the Spanish started growing coffee in highland plantations, and several regions are perfectly suited for coffee growing. Not many people in the coffee drinking world outside of the Philippines realise that the Philippines was one of the world’s leading coffee producers up to the late 19th Century. However tragically the industry was wrecked by coffee rust disease in around 1880, and after that the various Latin countries arose to prominence, and these have been followed by many other regions.Times are changing and Philippine coffee is back. The principal coffee plantation areas within the Philippines are centered within the highlands and mountain regions with the largest production area reportedly Sultan Kudarat in Mindanao. This is followed by Amadeo, Tagaytay and Silang in Cavite Province. Also the renowned areas of Batangas, Benguet, Bukidnon, Kalinga-Apayao, Davao, Claveria (not so far from Pagudpud in Ilocos Norte) and Misamis Oriental. There are four varieties of coffee grown in the Philippines. These are the Robusta, Excelsia, Arabica and Liberica. Arabica is grown at higher elevations, in places such as Baguio, which has an altitude of 1,500 meters above sea level. The Philippines are divided into 23 coffee-growing regions. They include the North Luzon (the main Arabica bean region) which comprises Benguet, the Cordillera mountain range, Mountain Province, Bontoc, Ifugao and Kalinga. The Central and South Luzon is the area from east Doña Remedios Trinidad (a large Robusta planting area) in Bulacan west to Bataan, and South to Cavite and Bicol. The Philippines has is also home to the most expensive and rarest of coffees. This is known as Kopi Luwak or Civet Coffee. We hope to soon offer this rarest of beans for customers. We really strive to serve good coffee, and we know there are many coffee places but very few good ones. We purchased a Rancilio machine in the Philippines and along with training all of our staff in good Barista principles now serve really excellent coffee. Of course we also sourced hard to get coffee materials and equipment in Australia where we often spend time. Every good hotel, restaurant and coffee shop has reliable and good gourmet coffee beans suppliers. 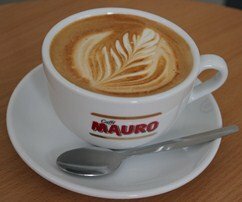 We serve only the best gourmet coffee beans using good machinery and well trained barista's.